Here is Anusham Special from Meenakshi Ramamoorthi who is known for her artistic and aesthetic taste. 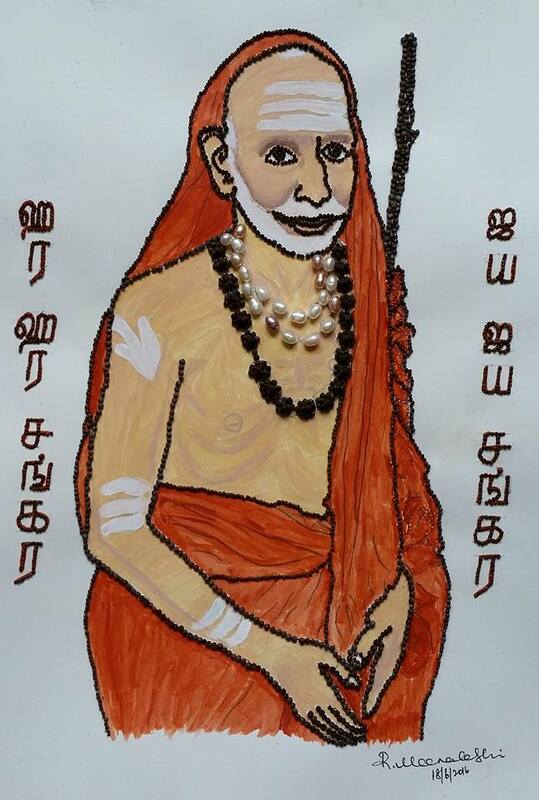 Every art and craft work of Periyava that Meena has done speaks for itself. Here is கடுகு பெரியவா made by Meena. She has made Maha Periyava painting with Mustard seeds. Thanks for sharing. I got influenced with this idea by listening to Maha Periyava Experiences Video of “Seppu Ramamoothy” mama. In that video he was narrating an incident that someone made “HH Brahmendraal” with Kadugu and showed it to Maha Periyava. And Periyava appreciated that and asked them to preserve “Kadugu Brahmendraal” at His Adishtaanam. I have listened to this interview couple of times earlier. But this time, it struck me that why not I make one for Periyava and name it after Periyava like “Kadugu Periyava”. It is all His blessings. Maha Periyava ThiruvadigaLe CharaNam! Apurva Dharisanam! May Maha Periyava’s Blessings be ever on the artiste and all of us, Devotees! Hara Hara Shankara, Jaya Jaya Shankara! may the maha periava bless you with his abundant grace always. Kadugu too Small. Periyava Very Big. Both together What a wonder? Is it also Advaitham! Namaskaram Ganesa Sarmaji! You are correct. Mahadbhyaha: Kshullakebhya says Sri Rudram. Mahadbhyaha – Who is very Big. Kshullakebhya – Who is very small.